In April I was fortunate to be able to participate in an excellent regional workshop on ship safety management in Port Moresby, Papua New Guinea. Organised jointly by the International Maritime Organisation (IMO), the Pacific Community (PC) and the National Maritime Safety Authority (NMSA) of PNG, it was one of the most productive, sensible and realistic conferences I have ever attended. Congratulations are due to all concerned with its organisation. While the workshop overall was concerned with all kinds of vessel safety, it soon became obvious that domestic ferry safety was foremost in the minds of most participants. That is unsurprising given the Kiribati disaster in January that killed 99 people and the still recent (2012) Rabaul Queen sinking in PNG that resulted in 350 fatalities. Both vessels concerned were owned by serially offending operators! As I discovered from delving into the Baird Maritime Passenger Vessel Accident (BMPVA) database while preparing for my presentation, the Pacific islands have a terrible record for domestic ferry safety. Indeed, since January 1, 2000, the PC member states have a slightly worse fatality record than either Indonesia or the Philippines, which are, along with Bangladesh, generally regarded as the most dangerous places for ferry travel on the planet. Obviously, this is compared on a per head of population basis. Absolute numbers are not quite so terrifying given the tiny populations of most of the island nations other than PNG. Even more frightening is the news of the importation of an ancient former BC Ferries Ro-Pax ferry to Fiji and the looming threat of three more. It seems that "political interference" has been a factor in that project. The first vessel is entirely inappropriate to Fijian climatic, sea and economic conditions. Apart from being 63 years old, it was designed for operation in sheltered waters in a rich country with excellent maintenance facilities and generally high crewing standards. It also happens to be so riddled with asbestos that it could not be sold in North America, even for scrap! It became obvious as the conference proceeded that political interference was a major problem in many of the island nations. While closely related to comparative poverty, it is a separate but significant factor that severely inhibits ferry safety. Of course, in unusually archipelagic and comparatively poor nations such as the Pacific islands, Indonesia and the Philippines, the major causes of domestic ferry fatalities remain, unsurprisingly, unseaworthy and overloaded vessels. Given the shocking safety record of elderly monohull Ro-Pax ships in developing countries – they accounted for 32 per cent of fatalities globally from 2000 to 2015 – there is no doubt that the sale of ancient Ro-Pax ferries such as that to Fiji should be banned. The neighbouring island nation of Tonga knows of their dangers from the bitter Princess Ashika experience. That elderly and wholly inappropriate Japanese Ro-Pax vessel sank in 2009 with 78 fatalities. An analysis of the BMPVA database also clearly shows that multihull ferries, when properly designed, constructed and maintained, are infinitely safer than their monohull counterparts. Their fatality toll is a tiny fraction of that of monohull ferries on every basis of comparison. It is, therefore, painfully obvious that new, or at least good second-hand, catamaran or trimaran ferries would be the answer to the safety woes of the island nations. They need not be fast nor complex or sophisticated, just safe, stable, buoyant, reliable and low maintenance. FRP or steel construction should be possible as well as aluminium. The obvious problem with this proffered solution is relative poverty. The island nations cannot really afford such vessels or the all-important crew training that should accompany their introduction. There is, however, an obvious answer to that. The island nations and, for that matter, Indonesia and the Philippines are all significant recipients of aid from richer countries. Of course, much of that aid is poorly directed and administered and much is overly aimed at gaining strategic advantage. Donor countries, if they carefully thought about it, could get much better value for their aid dollars. In the May/June issue of sister magazine Ausmarine I recommended that Australia and New Zealand, as world leaders in the design and construction of fast multi-hulled ferries, should introduce the provision of appropriate ferries into their aid programmes. Now, having participated in the Port Moresby workshop, I have thought further. Other rich nations around the Pacific Ocean such as the USA, Canada, Japan, Korea, China and Singapore could beneficially modify their aid programmes to incorporate the provision of appropriate ferries to the dangerous archipelagic nations described above. Not only would they benefit the island inhabitants and tourists, their generosity would start at home by providing business for their own naval architects, ship builders and maritime colleges. Rather than funding inappropriate cultural centres, roads to nowhere and basket weaving classes that have little or no economic or social benefit, why don't those rich countries re-focus their aid programmes on something more practical and valuable? Sign up to receive the latest news, articles and advice! 33 new LNG ships have been ordered so far this year, compared to 19 in the whole of 2017 and just six in 2016. Owners have been tempted by higher spot/short-term charter rates, still-low newbuilding prices and rapidly growing LNG trade. New LNG supply is being absorbed far more easily than many expected by booming demand in Asia. A new wave of FIDs on new supply projects is expected to create even more demand for shipping. But owners need to be careful they don't over order. There is still a huge number of ships ordered in the 2011-2014 LNG newbuilding boom to be delivered to the fleet and there is a long history of new ships arriving before new supply. LNG shipping is benefiting from an unprecedented wave of new LNG supply projects coming on stream in a relatively short period. Between 2015 and 2020 LNG production is forecast to increase by over 150 mmtpa; in comparison, supply rose by just 20 mmtpa in the five year prior to 2016. 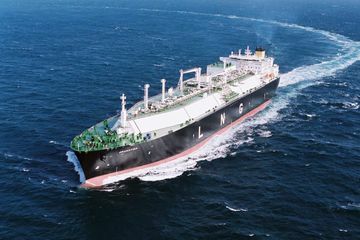 For LNG shipping this supply boom is particularly beneficial, as much of it is coming from the US Gulf which is a long way from the largest LNG markets in Northeast Asia. To move one mmtpa of LNG from the US Gulf to Japan requires 1.9 ships, compared to 0.7 to move the same amount of LNG from an Australian project. The huge increase in LNG supply has so far been comfortably absorbed by rapid growth in demand. China has been at the forefront of demand growth with imports in the first half of 2018 up 50 per cent, following 46 per cent growth in 2017. Chinese LNG demand is also taking a more pronounced seasonal shape as new terminals have opened up in the north of the country requiring more LNG in the winter months. The apparent ease by which the current wave of new LNG supply is being absorbed by markets has turned attention to who will develop the next wave of LNG supply. Wood Mackenzie currently forecast that 114 mmtpa of new LNG capacity will take FID between 2018 and 2021. These pre-FID projects will not provide any new LNG to the market until at least 2023 and most of it is unlikely to be available to ship before 2025. Between the current wave of new LNG supply and the anticipated pre-FID wave there will be a period of low LNG supply growth. Ships being ordered now will deliver just in time for the start of the period of low supply growth. In real terms newbuilding prices for LNG ships have never been lower. Elsewhere in the shipping industry newbuilding prices have begun to creep up and prices for LNG ships will eventually follow the trend. The newbuilding prices look even more attractive when you consider how much more you get for your money with the latest ship designs. The temptation for owners is to order sooner rather than later whilst the newbuilding price remains low. Vessel design and technology advances have seen the typical new order LNG ship become larger and more efficient, making ships ordered even three or four years ago outdated. Ship orders now are typically sized at 170-180,000m³, compared to 155,000m³, dues to design advances and to maximise carrying capacity through the newly expanded Panama Canal. In addition, the introduction of gas-injection slow-speed engines has offered fuel savings of over 20 tonnes per day even against modern DFDE/TFDE engines and 75 tonnes per day against older steam ships. So far this year 36 new vessels have been added to the fleet and three have been scrapped. A further 22 are scheduled for delivery before the end of the year – if these vessels are delivered on time and no further vessels are removed from the fleet, capacity will grow by 13.0 per cent in 2018 (up from 6.8 per cent in 2017). The 37 vessels currently scheduled for delivery in 2019 will grow the fleet another 7.6 per cent. LNG trade is growing strongly but our forecast of an 8.2 per cent expansion in 2018 lags behind fleet capacity growth. More long-haul imports from the USA to Asia should see tonne-mile demand grow at a faster rate, leaving a delicate balance between supply and demand for LNG ships. But forecast trade growth of 13.7 per cent in 2019 should tip the balance in favour of ship owners. Swings in where US exports go are creating more volatility in spot/short-term LNG charter rates. Peak demand periods in Asia see more US exports attracted to long-haul destinations, taking ships out of the Atlantic basin. This drives up charter rates globally, but drives up rates even higher in the Atlantic basin. In June charter rates in the Atlantic basin peaked at around US$90,000/day, whilst rates in the Pacific Basin at the same time were closer to US$70,000/day. Industry outlook – too little too late or too much too soon? LNG is one of the fastest growing sectors in shipping and design advances have made new ships more attractive compared to much of the existing LNG fleet. The market clearly wants more of these new ships and it could be said orders have been too little too late. But looking at the wider picture there is a lot of new capacity still to be delivered from the current orderbook. There is under-used and laid-up older shipping capacity that could be more fully employed. The next pre-FID wave of LNG supply won't come on stream until mid next decade. If ordering activity continues at recent levels there is a high danger that it will be too much too soon!